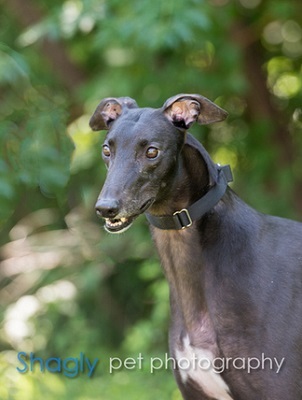 Lou Lou, aka Kells Black Gold, is a 5-year-old black female born April 7, 2010. Her sire is Gable Sour Cream and her dam is the Irish-born Old Tradition. Lou Lou has 74 races on record at Greyhound-data.com, all at Gulf Greyhound Park from October 2011 to February 2013. 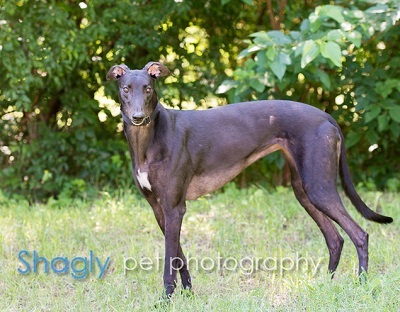 Lou Lou was found as a stray near Baytown, TX. She has a large wound on her elbow and has tested positive to heartworm. Lou Lou has not yet been tested with cats or other small animals. The wound on the inside of Lou Lou's left elbow is healing slowly. Because it was a large deep open wound (the size of a silver dollar at least), it is having to heal from within. Once it is closed up her heartworm treatment will begin. Lou Lou's deep wound has healed sufficiently, and her first heartworm treatment was March 25, 2015, with her second being April 29 and 30. It will be eight weeks until she will be ready to be tested again. She is being kept very quiet in her foster home. Lou Lou is still testing positive for heartworms, so it will be 30 more days of being kept quiet in her foster home. Lou Lou has tested negative for heartworms and she has completed her medical procedures! She's ready to find that special forever home.